Riding on the high of yesterday's sew day, I finished a quilt that has been hanging around in my sewing room for far too long. 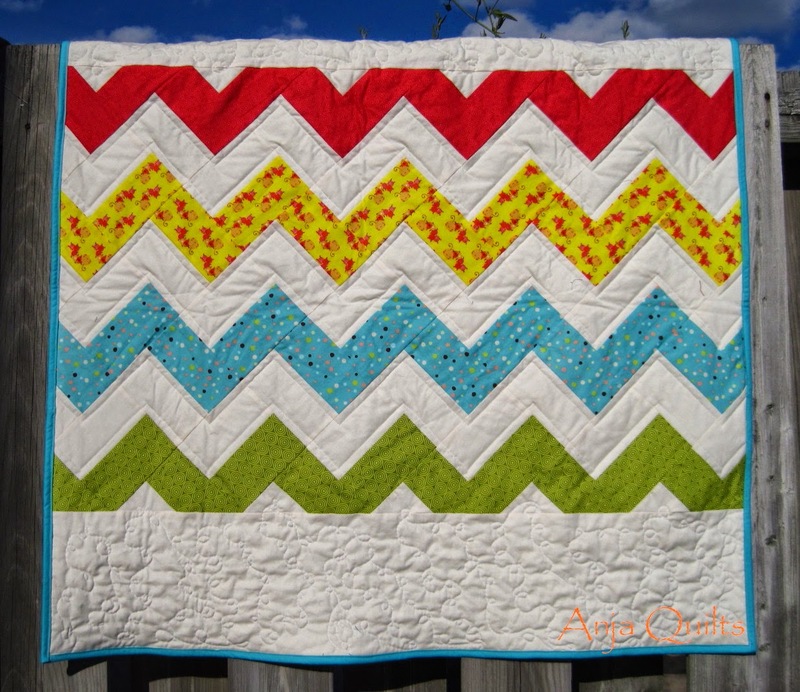 This is a strip quilt using the tutorial at Quilts + Color. I cut the red accent pieces 2.5-inch square rather than the 2.5 x 4.5 inch rectangle as indicated in the tutorial. Next time, I'll skip the borders. I thought the quilt needed to be "framed" -- but the borders were just a nuisance in the quilting process. When I started this quilt, I considered who the recipient might be. One name popped into my mind, but I dismissed it. When I pulled out the quilt last night to have it ready for quilting today, the same name popped into my mind. Okay...you don't have to hit me over the head. My friend turns 50 in a few months; however, I've decided to give it to him early, as we have learned first hand this week, that tomorrow is promised to no one. My goal for this week is to start sandwiching (and hopefully quilting) the five quilt tops taking up space in my sewing room. I've vowed not to start anything new until these quilts are finished. 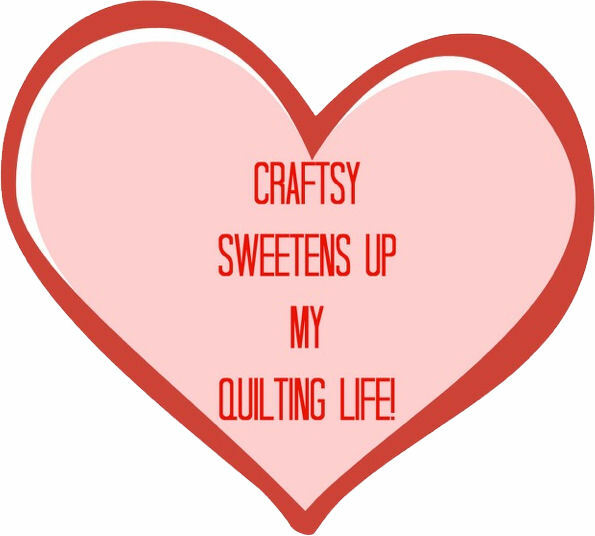 What are your sewing goals for this week? Today was sew day with Maritime Modern Quilt Guild. It's always a dilemma on what projects to take, and I always bring too many. Today was no exception. I bought several projects with me, but didn't finish them all. It was so hot today that it was difficult to sew. It seems that summer is trying to hang on for just a little while longer. And I'm okay with that! 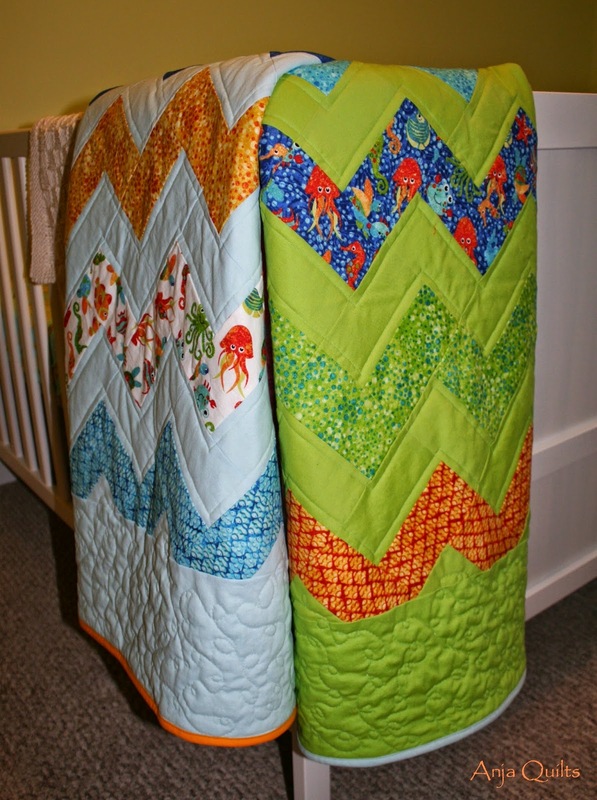 Here are two commissioned baby quilts that were finished today. I ran into Baby T (not really a baby, but at the time there were two T's, and we had to distinguish them somehow) yesterday and learned that he has a new baby. Unfortunately, he was two weeks' premature. So what to do? 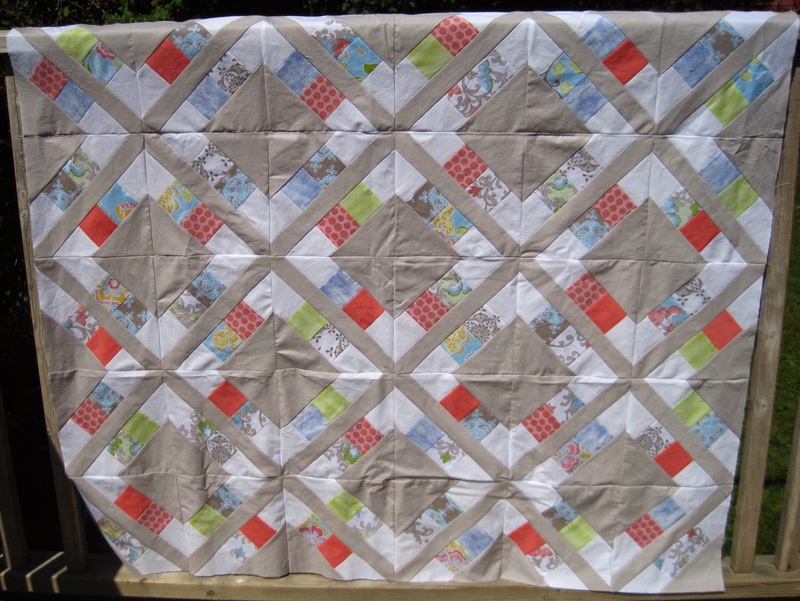 A baby quilt of course. Baby M needs all the love and encouragement he can get. This quilt will be delivered tomorrow. 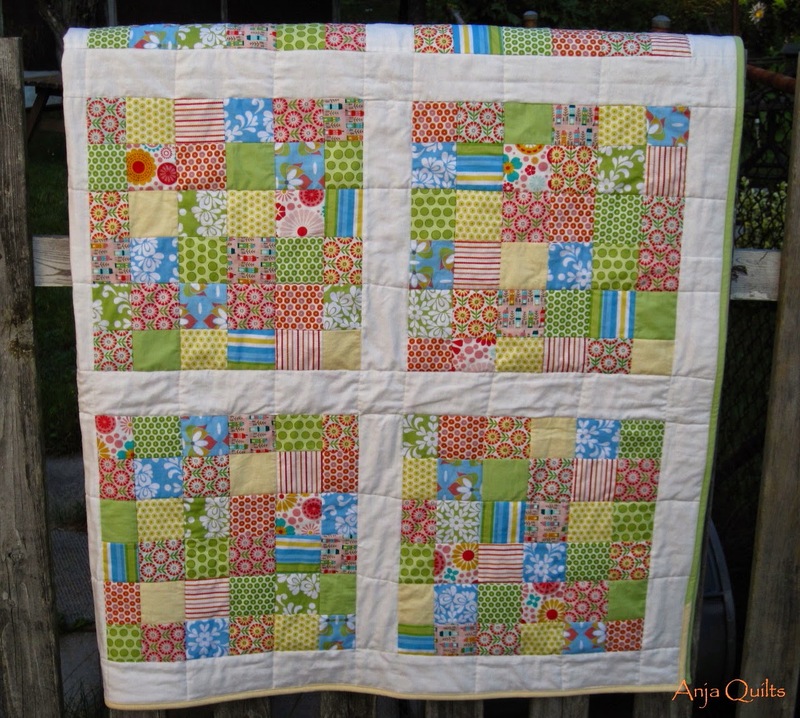 I enjoyed making this quilt and will likely make it again. Elizabeth Hartman has some great patterns. Head over to Oh Fransson to check them out. Yesterday was the celebration of life for E, who lived life fully every day. Just a reminder that tomorrow is not promised to anyone. Enjoy life while you have time. My quilt bee friend QJ, otherwise known as Jenn over at A Quarter Inch from the Edge, is expecting twins. She is also a Girl Guide, so her Guiding friends hosted a baby shower. It was difficult to decide what to make, but I finally decided on chevron quilts with sea creature fabric. And then on Thursday, one of our quilt bees hosted another baby shower. Two showers, two babies....two gifts needed of course. But what to make? I remembered I had some PUL fabric, so two changing pads. Thanks to QB for the pattern. Waterproof is always a good idea with babies. I love these ducks and monsters. I think a tote bag made with the monsters is next on the project list. It's that time of the month for The Library Project update. I finally quilted my postage stamp quilt. The pattern is from Oh Fransson. One more quilt to finish, and then I will have completed The Library Project. I'm off two days next week, so I'm going to tackle this last quilt. I have been procrastinating on this one because it's 85-inches square, and I'm going to do free motion quilting. I had been feeling very overwhelmed on the amount of quilting to be done and the size of the quilt, but some encouragement this week from QJ has convinced me to get it done. 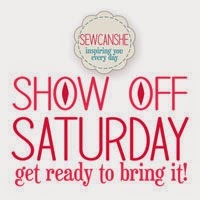 Since it's Saturday, showing off about my finishes this week and linking up with Sew Can She. What are you showing off about this week? Another great sew day with the Squares today. Sadly QB couldn't join us. But I bet she had lots of fun snuggling with her grandson. QJ over at A Quarter Inch from the Edge made some great fabric storage bins a few weeks ago. 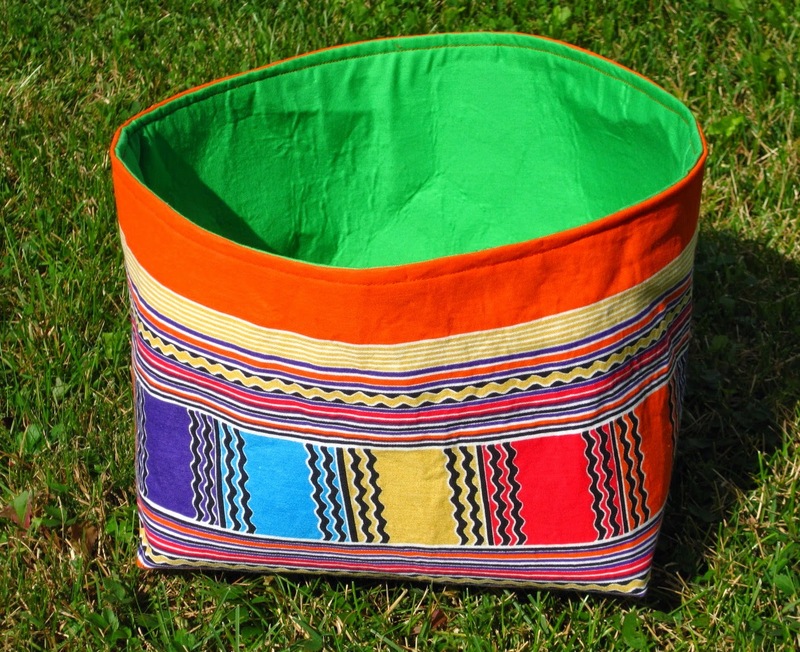 I really liked them and thought it would be a great way to use some of the orange and green fabric I bought in South Africa. I finished one and then ran out of fusible interfacing. Our LQS was out of stock of the weight of interfacing I needed (we always go out for lunch and a trip to our LQS on sew day), so a quick stop at another fabric store on my way home. And then finished storage bin #2. 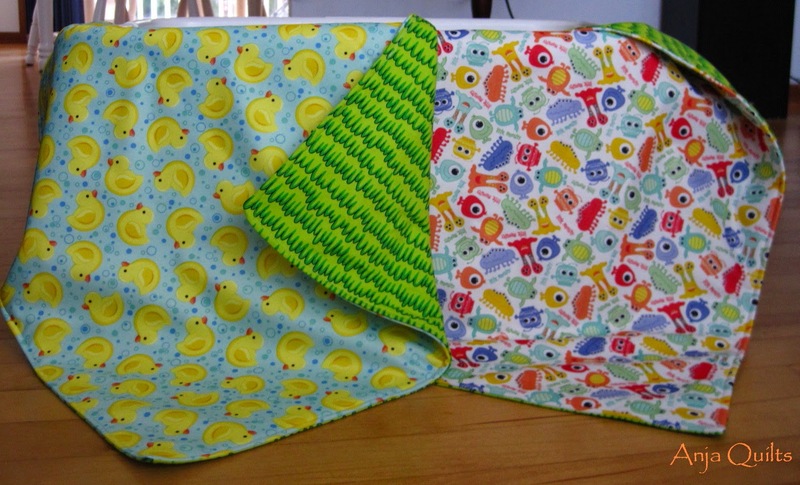 I also finished the two baby quilts tonight that had been in the QPP. Just under the wire, as the baby shower is tomorrow....at my place. Stay tuned for the reveal. The September meeting of the Maritime Modern Quilt Guild was this past week, and we had a zippered pouch exchange. 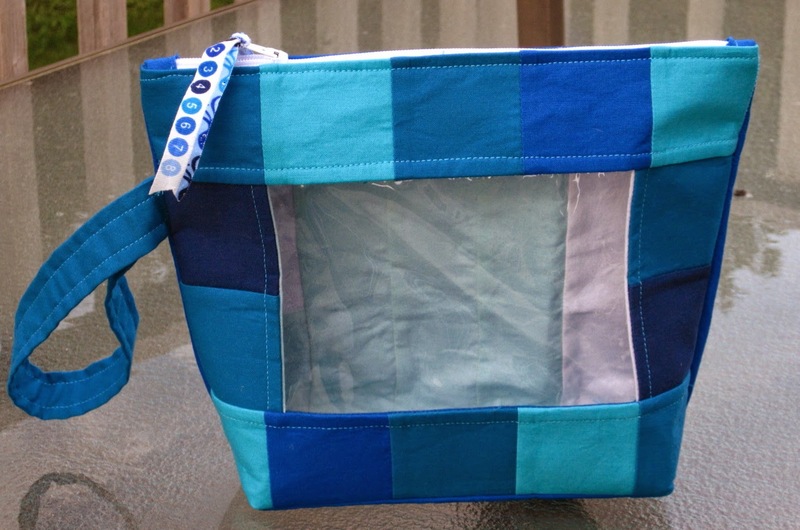 Make and bring a pouch, receive a pouch. I forgot to take a photo of the pouch I made with laminated fabric, but here is the great pouch I received from Scrapmaster. Thanks, Linda. I love it! Decisions, decisions, decisions...do I stay up late to do the housework I didn't do tonight because I was sewing? Or do I get up early and clean like a crazy lady before everyone arrives? Maybe a little tidying up and then a hot bubble bath. 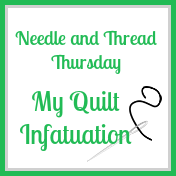 If I do housework tonight, then I'll feel like I can sew in the morning, and then there will be thread and bits of fabric everywhere, and then I'll have to clean again. 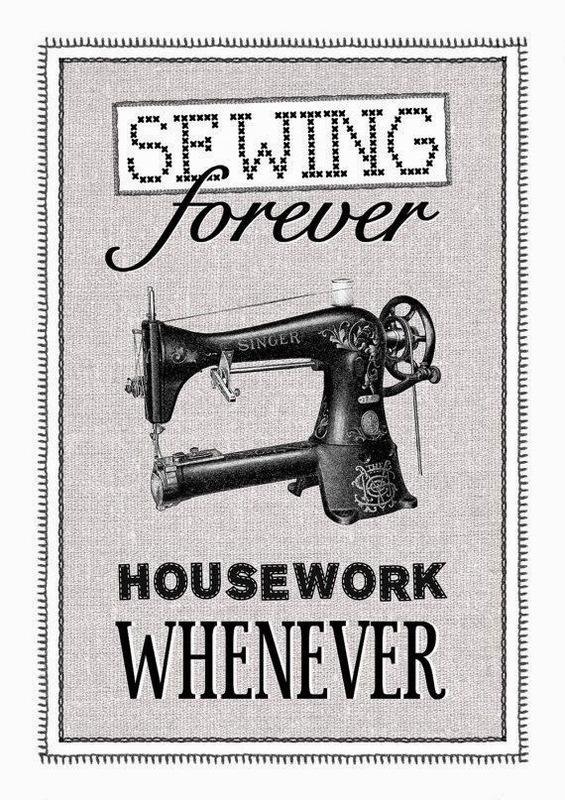 I hope you had some fun sewing today. Not much quilting in this house the past week. I just wasn't feeling it, so I took a break. I figured the fabric and WIP's wouldn't go bad and would be waiting for me when I was ready. Instead, I read, watched some TV, maybe had a nap or two, some Girl Guide stuff....it didn't take long for the week to go by. And back in the sewing room tonight finishing the piecing on the Gray Square Scramble pattern. I am quite pleased with the results. It finishes 55 x 72 inches. I would make this pattern again. I'm undecided on how to quilt it. Luckily, Maritime Modern Quilt Guild meets on Thursday, so I'll get some advice. All my WIP's are now finished quilt tops waiting to be quilted -- my least favourite part of the process. 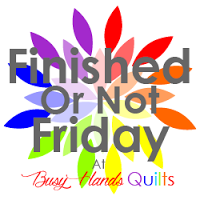 So it's time to buckle down and start quilting. Other than a few skirts for my goddaughter and maybe a few fabric baskets, I will not be starting any new quilts until I get this tops quilted. 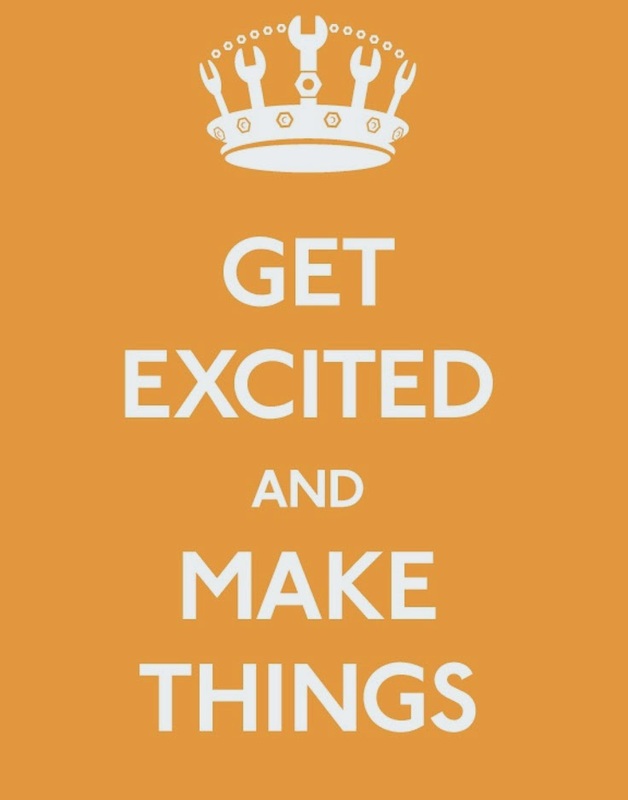 What are you excited about this week? Any new projects you want to start? 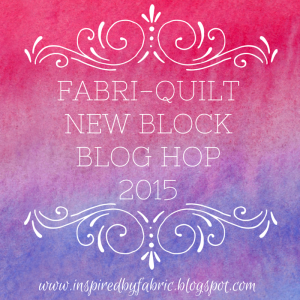 It's my turn on the Around the World Blog Hop. 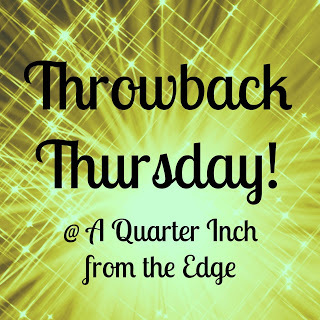 Thanks to Jenn over at A Quarter Inch from the Edge for inviting me along on this journey. 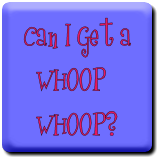 As a participant of the blog hop, each blogger is asked to share a little about herself (or himself). 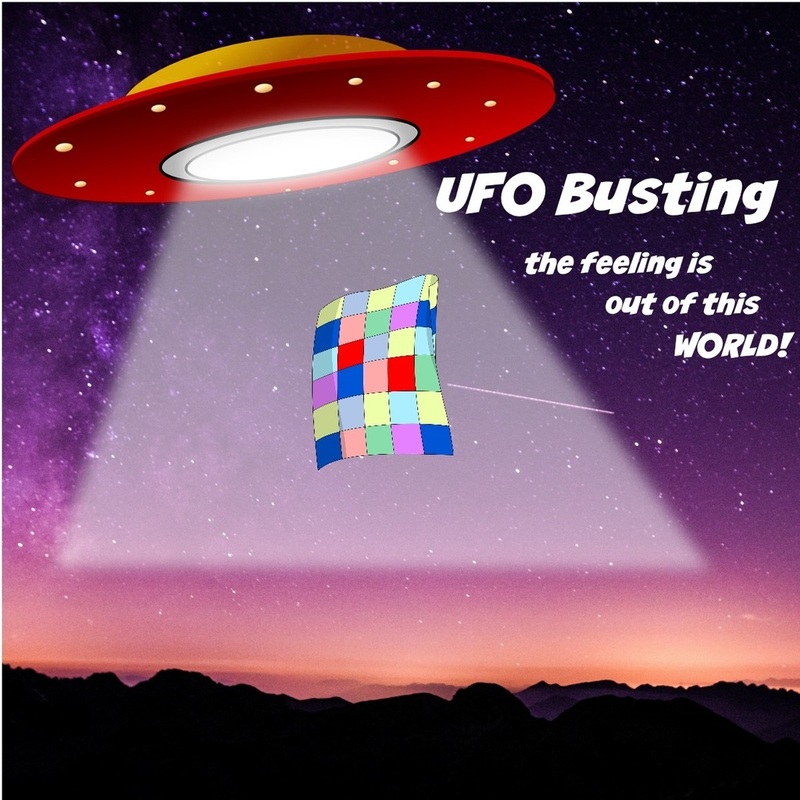 I'm new to the blogging world, just having started back in February, but I have been quilting for ten years. I have recently been moving out of my comfort zone and trying new things, like free motion quilting and improv piecing. I always have a few things (okay, a lot of things) on the go at any given time. I enjoy piecing the most, the quilting the least, so I'm always starting new projects. 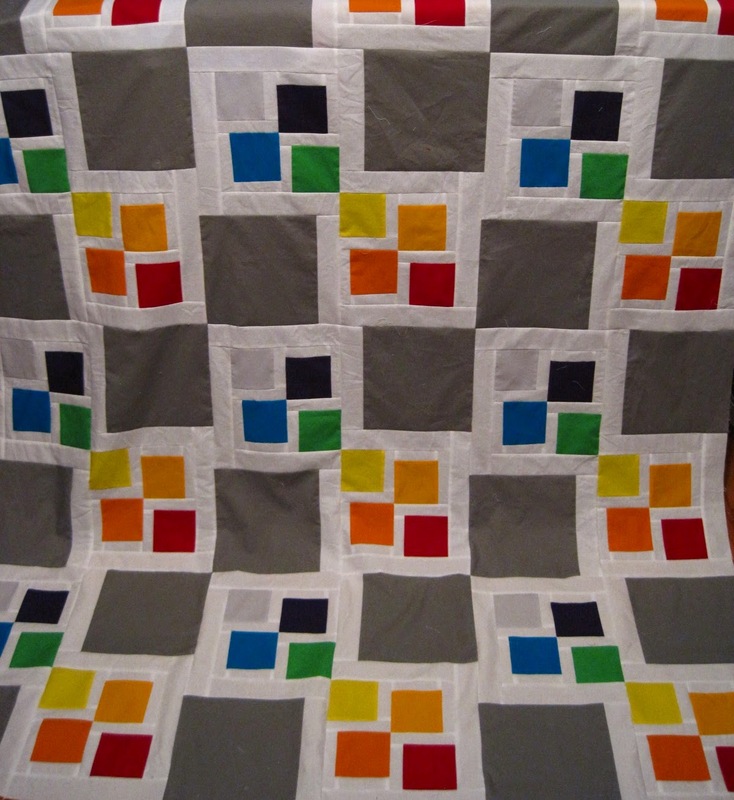 I'm currently working on a pattern from the Spring 2014 issue of Fons and Porter's Easy Quilts -- Gray Square Scramble. I just finished piecing Candy Scraps -- a pattern over at Moda Bake Shop. I'm also working on some things that are in the QPP (quilt protection plan). As you may have already read about over at A Quarter Inch from the Edge, my friend Jenn is expecting twins in a few months. Do you know how hard it is to make something for something who can make her own stuff???? 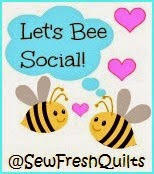 I have a few new ideas that I want to work on, but I need to get all my quilt tops quilted before I start anything new. Oh boy....what am I saying???? I've put out it there in the universe, so now I have to follow through. I don't know how my work differs -- and quite frankly, I don't care. I just make what interests me and what makes me happy. Sometimes that's something modern, sometimes it's something traditional. I like to make things, and most of my quilts are gifts, either for family and friends or donations to our local children's hospital. 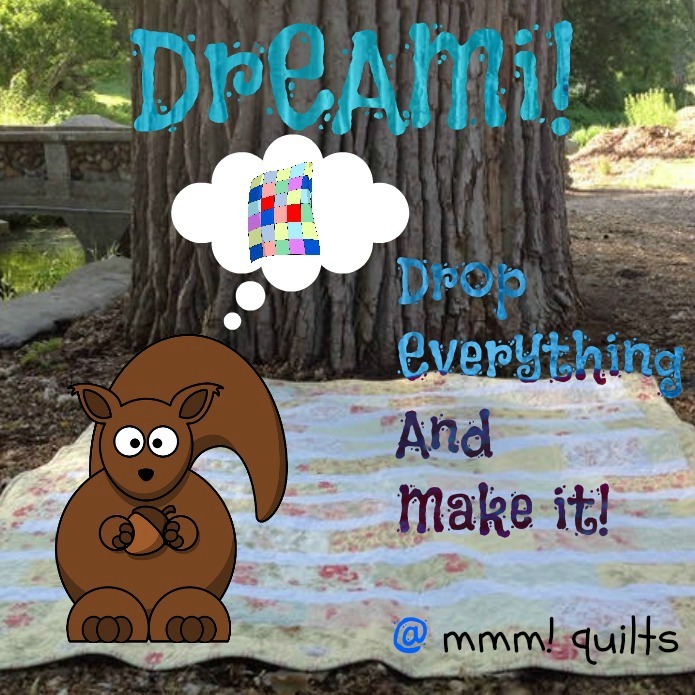 I don't want to be painted inside a tiny little box of being labelled as a modern quilter, or a traditional quilter, or whatever the term of the day is. I. Am. 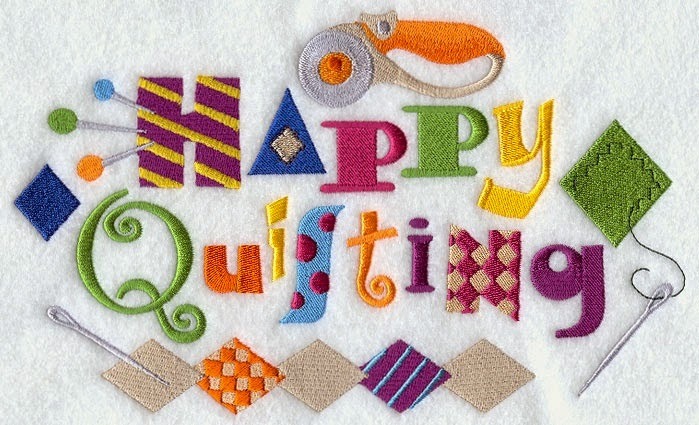 A. Quilter. 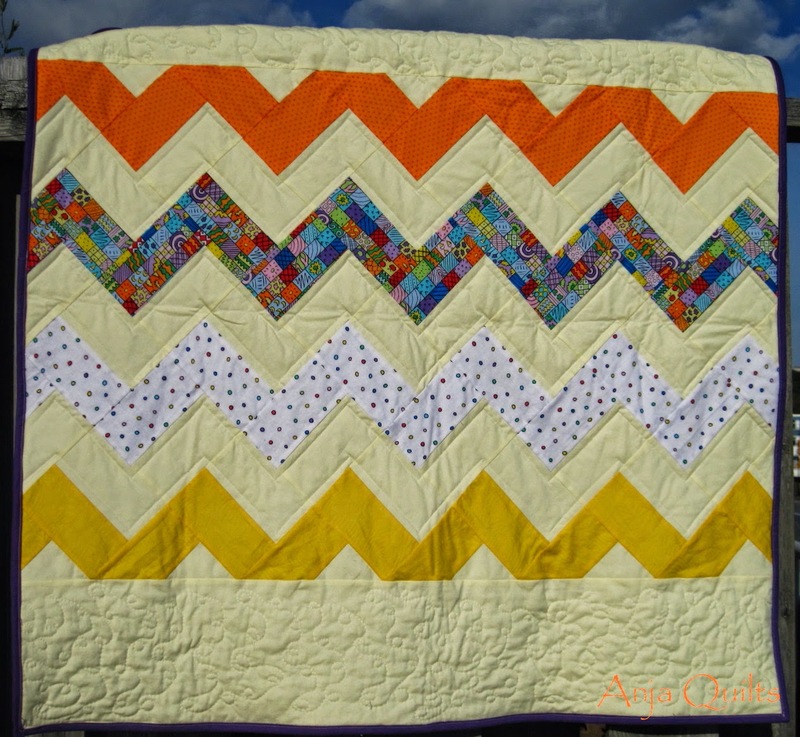 I love orange and finally made myself an orange quilt. Brandon Mably likes my quilt. To be honest, I started my blog in order to enter a contest. Yes, the possibility of a free gift is a great motivator. Jenn is a bee mate of mine, who has been blogging for some time and who has always encouraged us each to start a blog. 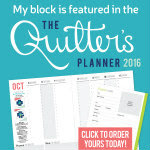 I have found that it's a great way to keep track of the projects you're working on, and a great way to share with family and friends. 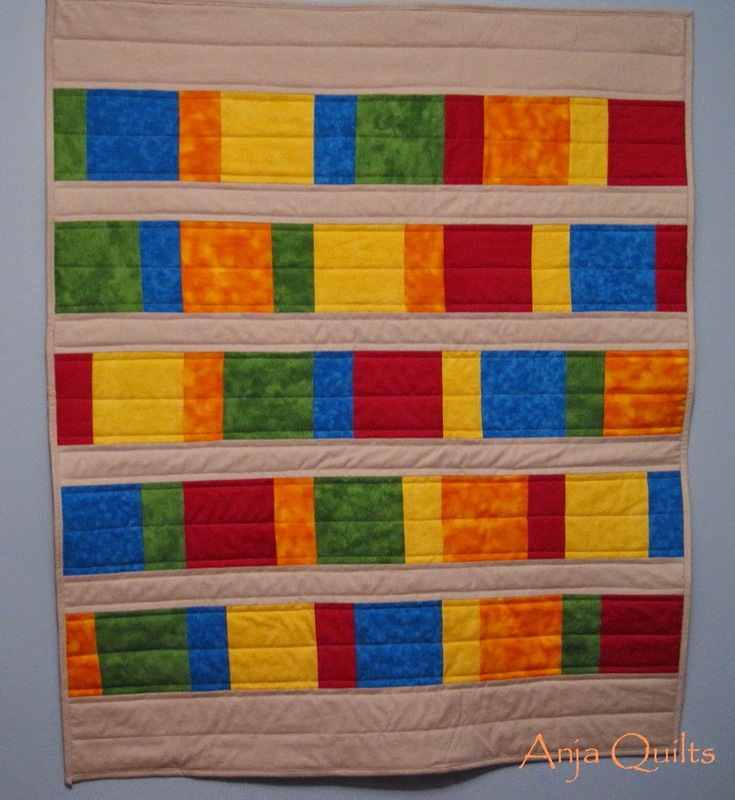 Life sometimes gets in the way, and then quilting comes in second, or third, or even fourth. 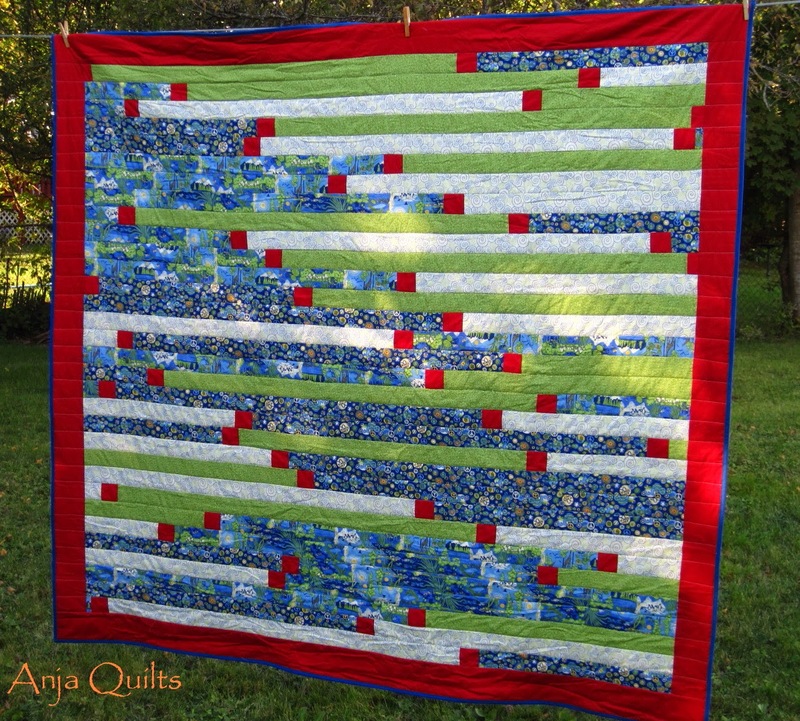 My goal is to make quilting part of my regular routine, rather than finding time to quilt. Having a blog makes you accountable to make things, as you need to write about something. My creative process begins with me seeing something I like. And then I make it. I need a pattern, but I'd love to be able to design a quilt. I'm not quite there yet, but I'm hoping that as I read more blogs and try more new things, I'll eventually get there. My bee mate QD can look at a photo and them come up with a pattern. That's a great talent. But I admit I have been known to make jokes at her expense when she pulls up her Excel spreadsheet to work on a quilt. 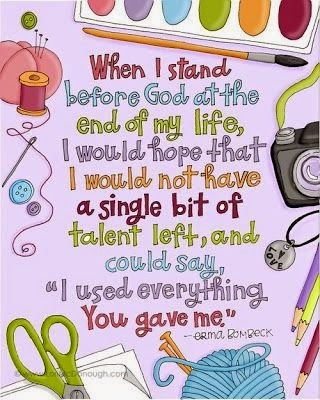 I use my talent as best I can, with the hope that I can improve on it as times goes by. I recently bought some fabric that intrigued me, although I have no idea what to do with it. Guess I need to put on my design hat -- or fascinator as the case may be since I own more fascinators than I do hats -- and come up with a plan. Thanks for stopping by. I've also invited a few friends along for this journey. 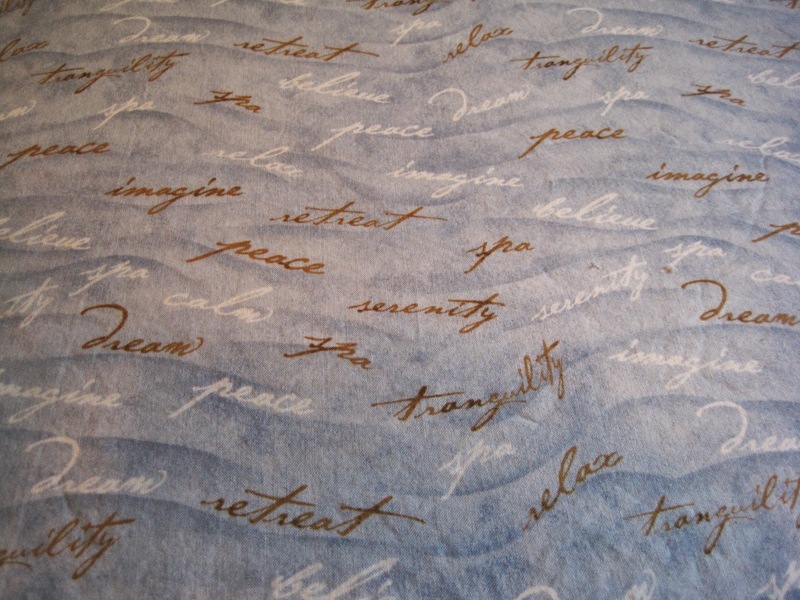 Quilt Matters - I recently met M-R when she attended a Maritime Modern Quilt Guild meeting while on vacation. M-R provided some great tips for improving my blog. Check out her blog to see what she's been up to, including being featured with her son Daniel in the fall issue of The Canadian Quilter. The Running Thimble - Dominique is a fellow member of the MMQG. As we have gotten to know each other, I discovered that she works with a cousin of mine. Small world. Dominique is great at making pillows and luggage tags.